Welcome to another episode of #ThatBusinessShow with Jamie Meloni here on #1250whnz every weekday at 8am! It’s our favorite day of the week here on the show, #WorkingWomenWednesdays! Today we had my lovely co-host Stella Guidicelli on with us today, as well as our two guests, Tracey Metzger with For the Girls International, and Linda Bond, News Reporter with ABC Action News and author of several books including Cuba Undercover. Stella and I had a great time speaking with Jessica Rivelli with Working Women of Tampa Bay. We were all very excited, as The Working Women of Tampa Bay Conference is tomorrow! The Working Women of Tampa Bay Conference is on September 10th and 11th at the Straz Center here in Tampa. Unfortunately there are only ten tickets left, but you can get a ticket still using the promo code “meloni2015” and you will get 10% off of the price! There will be many speakers attending, including women who have gone on this show! Don’t miss out on this wonderful opportunity to meet people all over the city and exchange ideas and success stories! Another great day here on #ThatBusinessShow with Jamie Meloni and Stella Guidicelli! 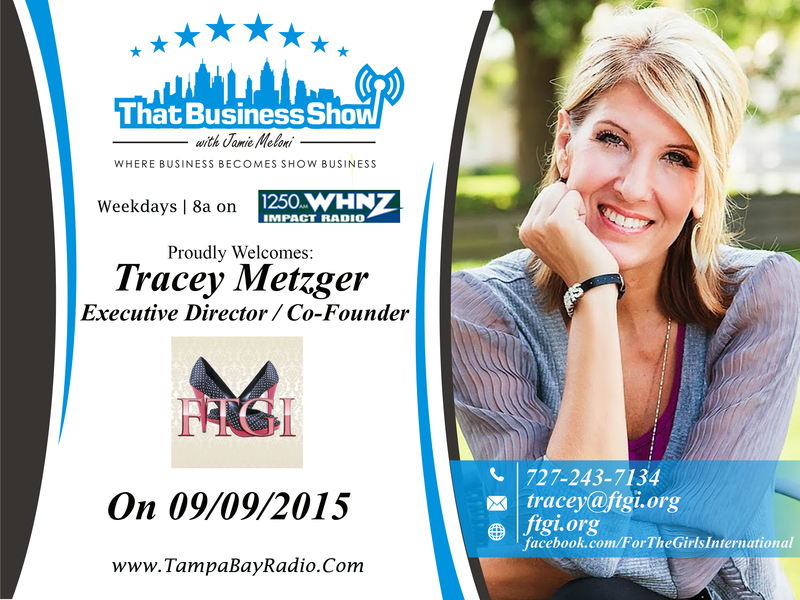 Here first on #ThatBusinessShow was Tracey Metzger with For the Girls International. Tracey Metzger is a speaker and blogger and the co-founder and President of For the Girls International, Inc. a non-profit organization headquartered in the Tampa Bay area. Through various avenues, Tracey spends her days connecting with women of all ages and walks of life and inviting them into a sisterhood of love, support, and encouragement. She loves meeting women, hearing their stories and encouraging them along on their journey. She spoke to us about the hardships of overcoming depression, and how she personally helps others overcome their hardships such as anxiety through faith. She spoke to us about her network, how she has over 300 women in her support groups, and they exchange ideas and offer each other support. Much like our friend Jessica Rivelli, her network works to better the lives of women in our community! (They actually work together so that fits well!) Tracey Metzger and the sisterhood of For the Girls International have a great story,and it was a pleasure to have her here on #ThatBusinessShow with Jamie Meloni. You can contact Tracey and find out more about For the Girls International at http://www.ftgi.org or at tracey@ftgi.org. 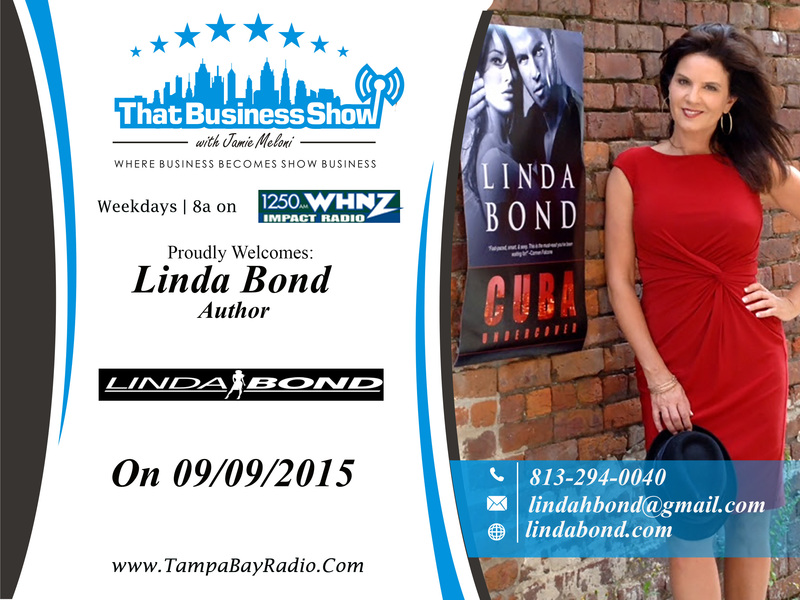 On our last segment was Linda Bond, News Reporter with ABC Action News and author of several books including Cuba Undercover. She’s worked as a television news reporter and anchor in Fort Myers, Orlando and Tampa Florida. For the past fifteen years, she’s been a health reporter, sharing important information with viewers on the latest medical breakthroughs and writing emotional, human-interest stories. With numerous Emmy awards and a “Don’t Quit” attitude, she is quite the force to be reckoned with! She discussed with us the difficulty of being an author and a news anchor at the same time also writing articles! Balancing all of that out, she wrote Cuba Undercover as a result of her adopted children from the country she fell in love with while covering a story over there. The story as we discussed is a murder mystery based in Havana, with “breathtaking scenes like nothing on the planet – Havana at night.” Be sure to pick up Cuba undercover and Alive at 5, available on amazon and on the iTunes store! http://bit.ly/CubaUndercoverAmazon http://bit.ly/Aliveat5Amazonlink You can contact Linda at http://www.lindabond.com. This entry was posted in Articles, Entrepreneurship and Business and tagged business, entrepreneur, radio, talk, working women of tampa bay. Bookmark the permalink.